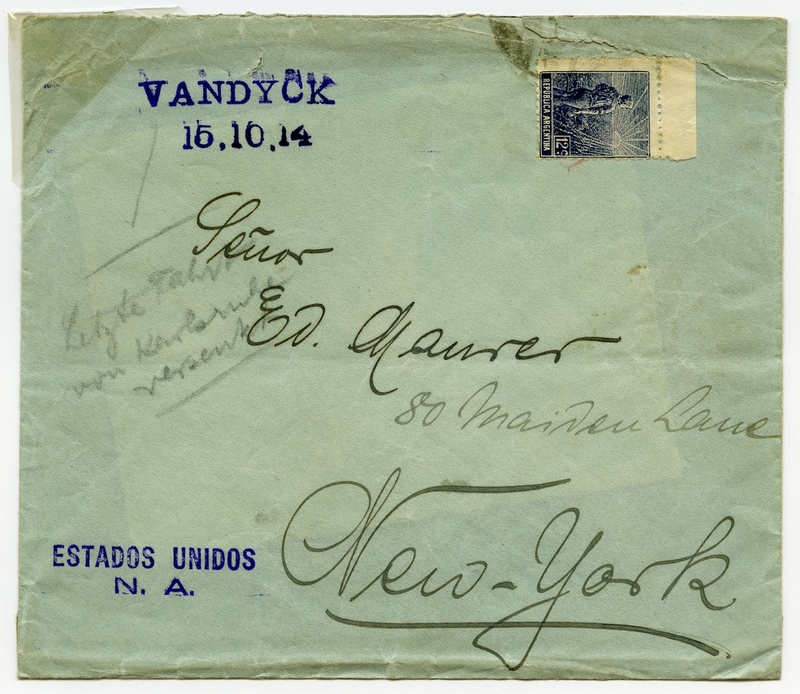 Vandyck was a British steamer of 10,328 tons, built in 1911 and owned by the Liverpool, Brazil and River Plate S.N. Co. Ltd. (Lamport and Halt Ltd.). She was captured by the German raider Karlsruhe on 26th October, 1914 while on a voyage from La Plata bound for New York. She was scuttled on 28th October, 1914. Adrian Hopkins had a cover addressed to New York with a 12c. Argentine Republic adhesive still attached, handstamped in violet in the top corner in large serif capitals, 40 mm. overall is "VANDYCK / 15.10.14". It is difficult to understand the significance of this. There are no date stamps of any sort except a faint arc which just ties the adhesive. It is possible that the ship's name was put on as an instructional mark by the despatching firm and that the mail was .taken off before the ship was sunk and delivered at a later stage. This is because the words "ESTADOS UNIDOS / N.A." (but in sans serif capitals) are handstamped in in the same colour in the left hand corner, in addition to the manuscript address New York.